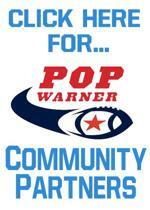 Programs in Several States & Countries – Pop Warner has active programs in several states and countries around the world. Little Scholars Program – Pop Warner is the only national youth sports organization in America that rewards its members for their outstanding performance in the classroom. 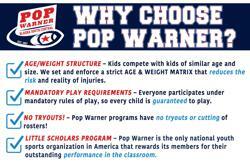 Stability – Pop Warner is the oldest national youth football and cheerleading organization in the world. Founded in 1929 by Joe Tomlin, we now have over 120 leagues and over 325,000 members. It's Inexpensive – Signing up for Pop Warner Football, Cheerleading or Dance is inexpensive. A typical registration fee for each participant ranges on average from about $175 to $200 for the season. *Registration fees are set by each local program. Pop Warner National Championships – Each year, Pop Warner hosts the Pop Warner Super Bowl and National Cheer and Dance Championships. For the past 11 years, the event has taken place at ESPN's Wide World of Sports Complex™ at Disney World. More than 300 cheer and dance squads and 72 football teams compete for the right to be crowned Pop Warner National Champion. National Scholar Banquet – Pop Warner hosts an awards program each year to celebrate the accomplishments of our participants. Nationally, we select First Team, Second Team and Honorable Mention All-American Scholars. College Scholarships - Each year, we award scholarships for higher education to the most deserving students in our highest grade levels. Pop Warner is proud to have awarded over $1.35M in scholarships since 1993! Age-Weight Structure – Kids compete with kids of similar age and size. We set and enforce a strict AGE & WEIGHT MATRIX that reduces the risk and reality of injuries. Volunteers & Coaches – We have over 40,000 volunteers and coaches that are being trained every year to offer the best and safest programs for you and your children. Coaching Education Programs –The safety of our athletes is always the top priority and that is why we provide extensive training for all our football and cheer & dance coaches. National Rule Book – Each Pop Warner Region, League and Association receive free National rule books for their organizations. Administrative Manual – Each Pop Warner Region, League and Association receive free National Administrative Manuals, designed to keep each League and Association current on all administrative matters, as well as to facilitate the daily operational management of those local organizations. Coaches and Adult Codes of Conduct – All coaches, football and spirit participants must abide by a Code of Conduct which includes several provisions. If any of these rules are broken, the League shall have the authority to impose a penalty. Free Online Roster Program – Pop Warner offers a free online roster program to all of our members to roster their participants easily and effectively. National Grants Program – For several years, Pop Warner and its national partners & sponsors have awarded thousands of dollars in national grants for teams and programs including start-up grants, national championship travel grants, equipment grants and more! FREE HELP and DISCOUNTS – Pop Warner sponsors and partners such as Under Armour, Team Cheer, Shock Doctor and Cutters offer free equipment and uniform merchandise as part of a grant program for new organizations as well as those in financial need. Pop Warner partners also offer Pop Warner only discounts and rebates on merchandise such as footballs, cheer and dance apparel, fundraising items. Competitive and Affordable Insurance – Pop Warner offers low-cost, broad insurance coverage as a benefit to its members. The Plan is specifically written to meet the needs of Pop Warner Little Scholars. The Pop Warner Insurance Committee, in conjunction with its Broker, periodically reviews the cyclical insurance marketplace to obtain the broadest possible coverage at the most competitive price. Find your local program and sign up today! Pop Warner Little Panthers "Preparing Champions for Life!" ©2019 Pop Warner Little Panthers / SportsEngine. All Rights Reserved.